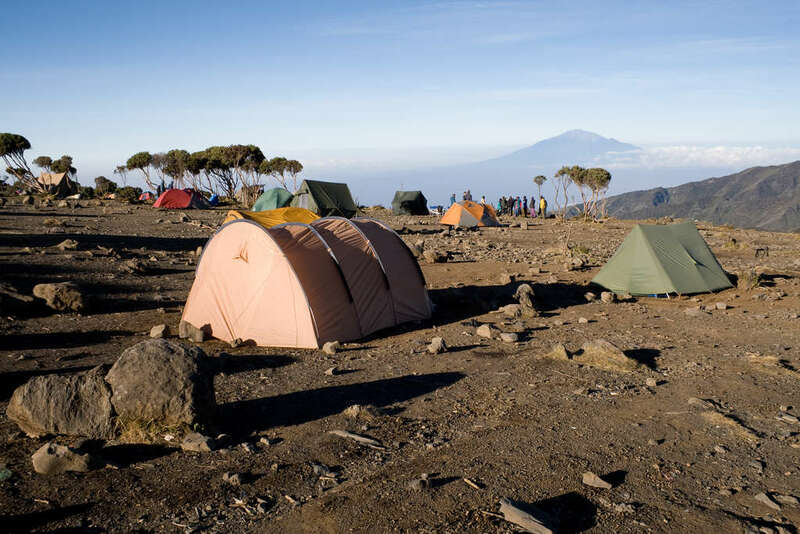 *The Machame Route is tent camping. 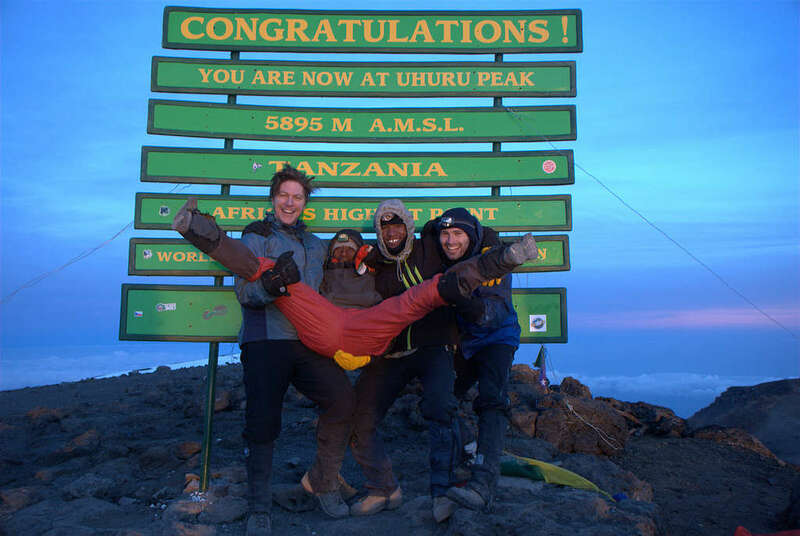 Your trip starts when we pick you up from the airport at Kilimanjaro from where we will take you to a hotel in Moshi for the night and you will be introduced to your mountain guide who will ensure you have all the necessary gear for the climb. The next morning it's about an hour drive to the park gate where you will begin the trek. 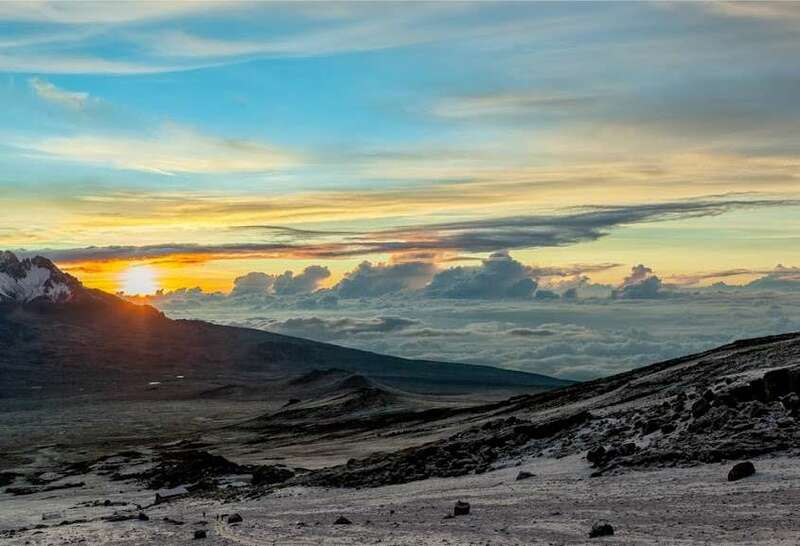 The first day of trekking is about 5 hours through the beautiful rainforest at the base of Kilimanjaro to the Machame Camp. The trek continues on the second day through increasingly sparse trees and bushes into moorlands and finishes at Shira Camp. 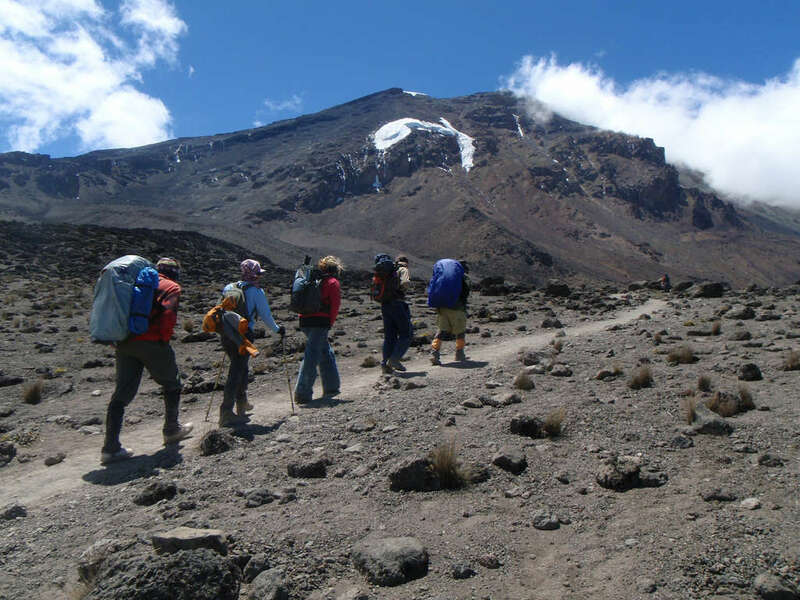 The third day of trekking is quite helpful for acclimatization as you ascend to the Lava Tower (15,000 feet / 4600m) before descending to the campsite in Barranco Valley. The area before the campsite is known as the "Garden of the Senecios", which features many huge senecio plants as well as the shorter lobelia plants. 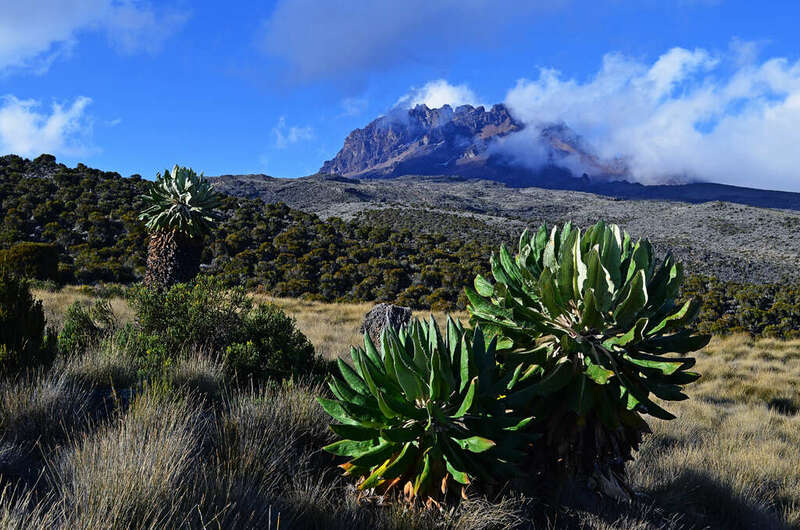 The fourth day starts with the ascent of the Barranco Wall, which is the most difficult climb and involves some easy scrambling. 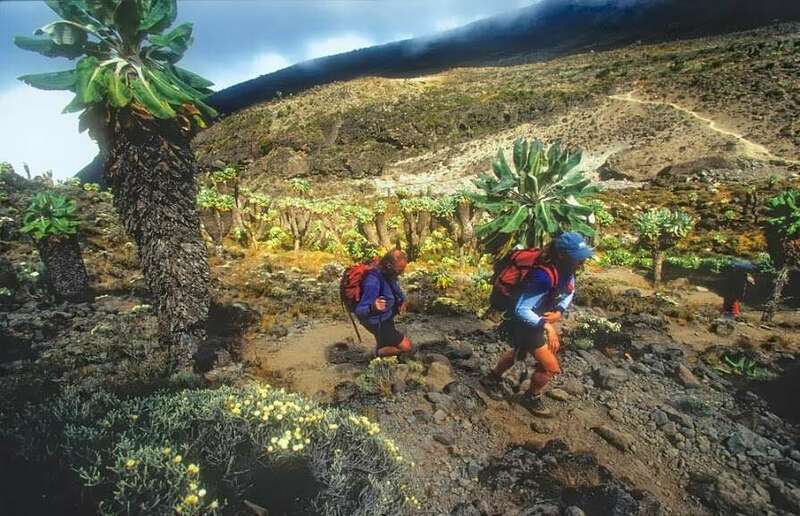 Continuing from the Wall the trail levels out and descends a bit to the Karanga River where you will take lunch before reaching the high camp at Barafu. The vegetation has disappeared completely by the time you reach Barafu and you’re a presented with a barren volcanic plain. The afternoon is spent resting here and the push to the summit begins at 11pm when you gear up for a midnight departure. Leaving at midnight it's a slow and cold 6 hour climb to the crater rim and then another hour traverse of the rim to Uhuru Peak the final summit. 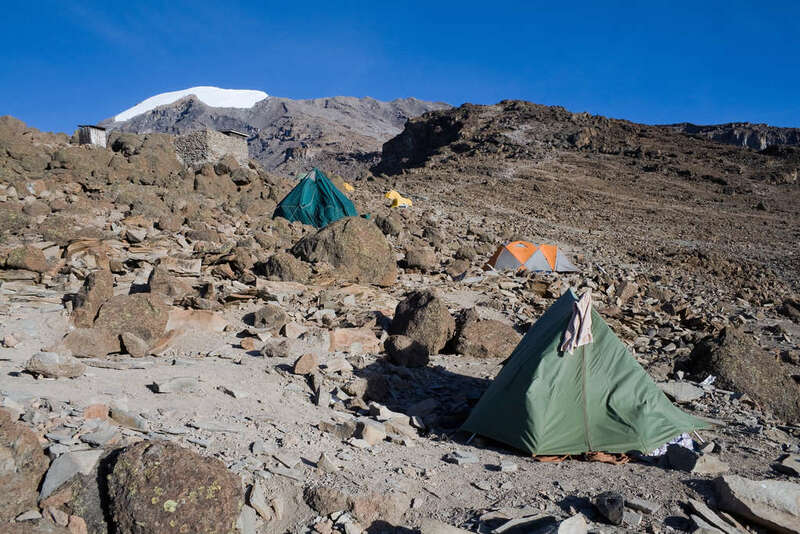 Having reached the summit you will descend again to Barafu take a short nap break and then continue to the lower elevations at Mweka Camp. 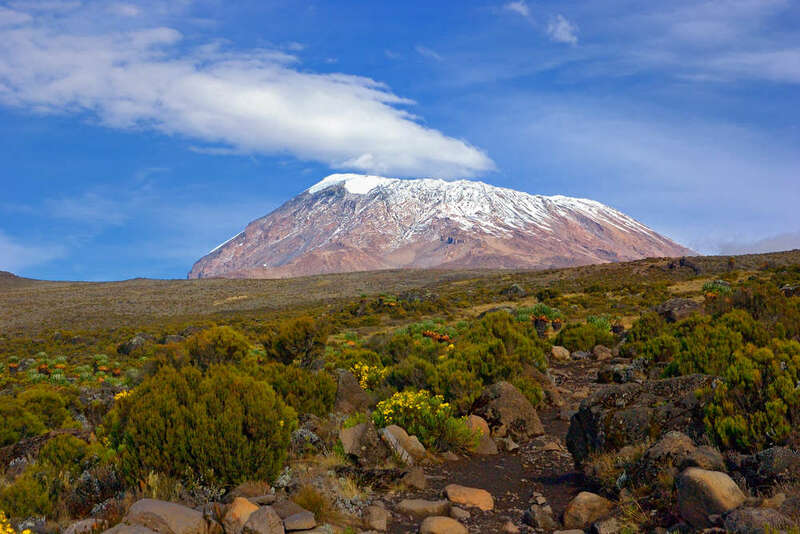 One of the reasons for such a long day of trekking is to avoid problems with acclimatization and get you back down to a lower elevation quickly. The sixth and final day has trekkers continue through the montane forest to Mweka Gate where transport will be waiting to take you back to Moshi where you will enjoy a final farewell dinner with the staff before departing the following morning. We will pick you up at the hotel in Moshi after breakfast and drive about an hour to the Machame gate where the trek starts. 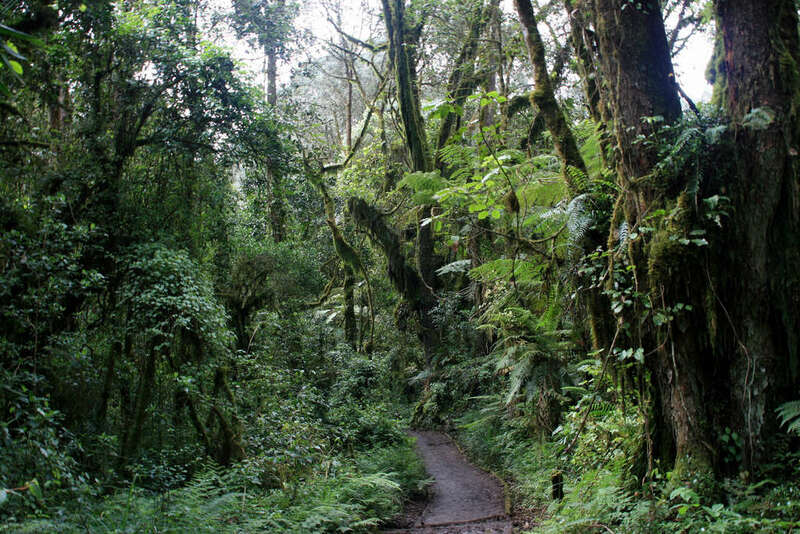 From the Machame Park gate it’s a gentle climb up through dense rainforest to the Machame Camp. The morning starts with a personal introduction to your trekking team. The hike is different today as the jungle gives away to zones of giant heather and moorland. If you have enough time you take a short hike to the Shira Caves after reaching camp. 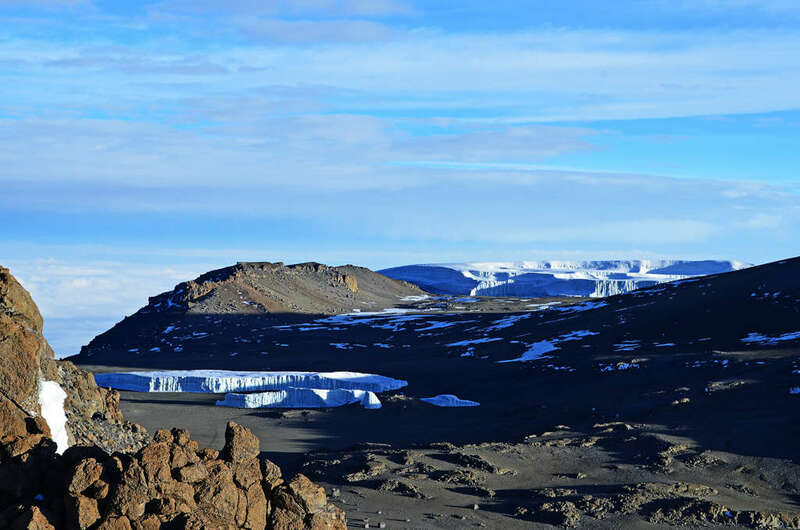 Leaving Shira camp in the morning you climb towards the main peak Kibo, with the western glaciers clearly visible across the rugged high-altitude desert of volcanic rocks and boulders. The trail ascends to the Lava Tower site (15000 feet / 4600m) before descending back down into Barranco Valley. Its 6 to 7 hours walking and the total ascent is only 110m total but having climbed much higher and dropped back down assists acclimatization. The day starts with a challenging climb up the steep Barranco wall (some scrambling but not technically difficult) before dropping into the Karanga Valley where you take a break for lunch. If you decide to add an extra day it will be spent at Karanga Camp. 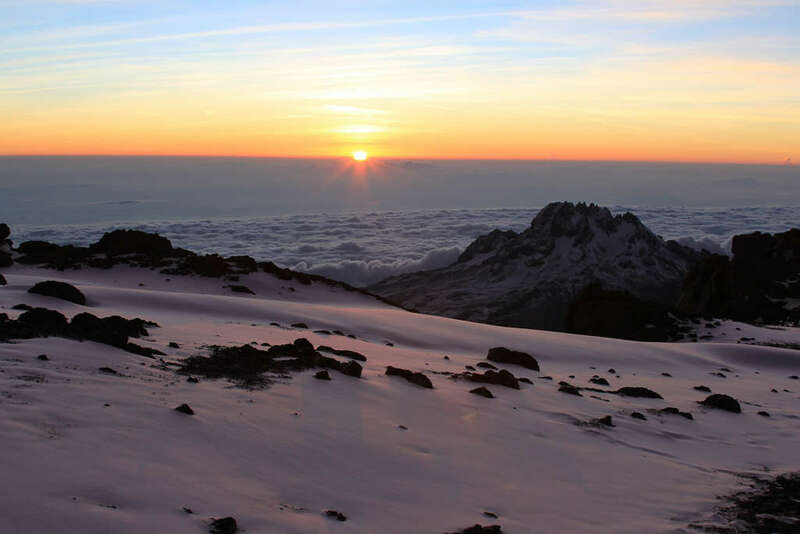 Those on the regular itinerary will continue after lunch to Barafu Hut having hiked a total of 5 to 8 hours and ascended 650m. This is the highest camp and the push to the summit will begin at 11pm when you start getting your gear ready. The day starts at midnight with the final push to the summit. It's a cold and grueling six hour hike to summit rim up a steep slope. The trail is doable but steep with many switchbacks. 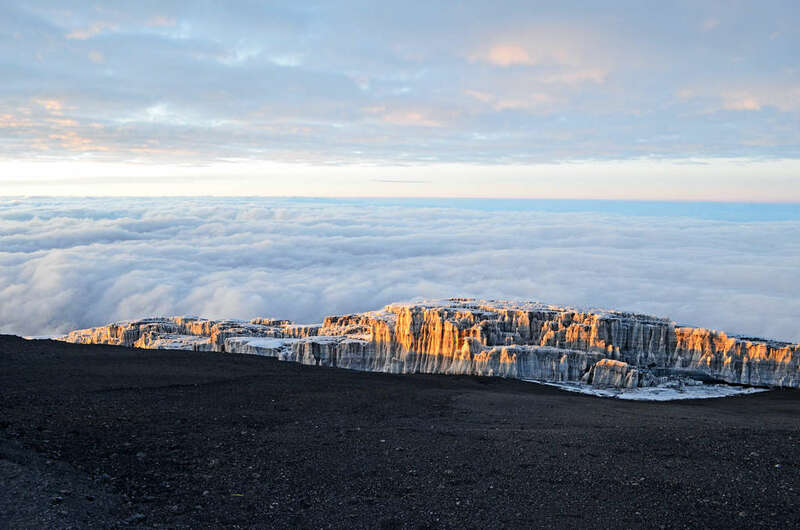 The summit rim is reached just about sunrise and it's a fairly level hike around the rim to Uhuru Peak the ultimate summit and highest point in Africa. Going down you will head back to Barafu Hut for a short nap and snacks before continuing down to Mweka camp (3068m/10,065feet). 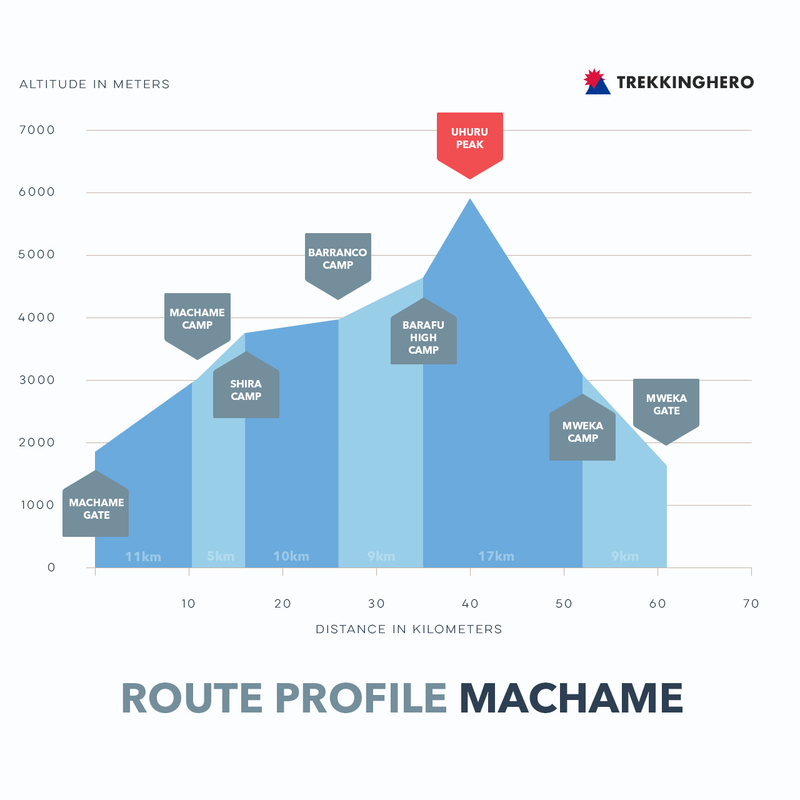 One of the reasons for such a long day of trekking is to avoid problems with acclimatization and get you back down to a lower elevation quickly. We suggest a minimum tip for your climbing staff of $250. (Please Review our Tip Guidelines).